Deer Get Revenge With A Pox On 2 Hunters : Shots - Health News The men nicked their fingers while dressing deer carcasses. Within a few weeks angry-looking raised lesions appeared at the sites of the cuts. Scientists determined that a virus from the deer had infected the men. 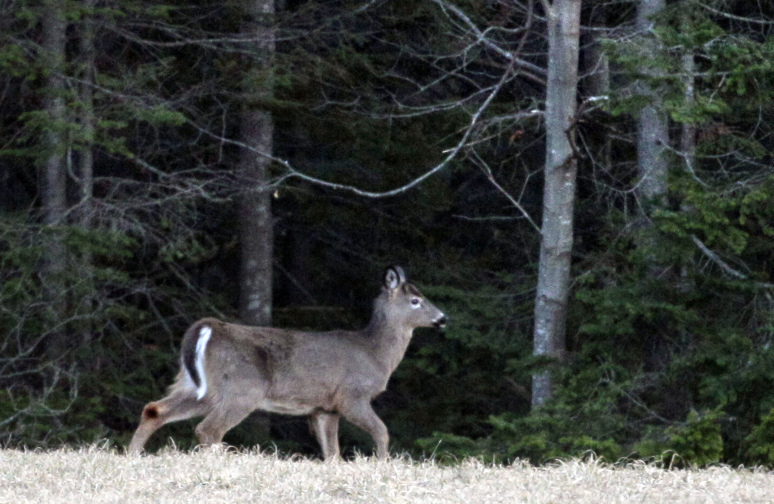 A white-tailed deer browses at the edge of a farm field in Brunswick, Maine. A couple of deer hunters, one in Virginia and the other in Connecticut, developed strange sores on their index fingers a few weeks after dressing two white-tailed deer they'd killed. The men nicked their fingers while dressing the carcasses. Within a few weeks angry-looking raised lesions appeared at the sites of the cuts. Their fingers were slow to heal, so the men went to their doctors. Samples from their fingers were sent independently to the Centers for Disease Control and Prevention in 2009 for analysis. The culprit? A previously unknown virus had infected the men. The CDC researchers, whose findings appear in the latest New England Journal of Medicine, concluded from DNA analysis that the virus belongs to a big group called parapoxviruses. Viruses like these infect goats, sheep, cattle and even reindeer. Sometimes the bugs jump to humans, like herders, who have a lot of contact with animals. The strain of virus found in the deer didn't seem to cause them any harm. And the men are OK, too. The Virginia hunter's lesion healed in about two months, though he still felt a little pain in the finger the following summer. The paper says the Connecticut man's "symptoms mirrored those" of the Virginia hunter. In an e-mail, the CDC's Dr. Inger Damon, senior author of the paper, confirmed both men "fully recovered" without any lasting problems. 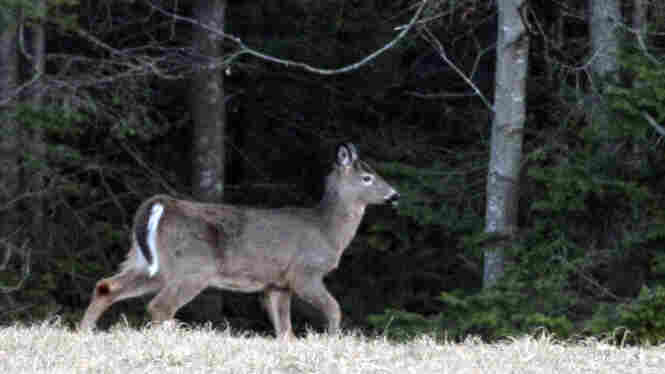 The scientists say this kind of virus doesn't appear to be a health problem for deer. And neither human case was very serious. Still, these types of viruses can cause trouble for people with weakened immune systems. And the lesions can be mistaken for something worse, like anthrax. There will probably be more reports of illnesses like these. There are more than 20 million deer romping around the United States these days, up from just 500,000 in 1900. The scientific paper says there are about 10 million deer hunters in this country. As a precaution against parapoxviruses, hunters could wear protective gloves when dressing deer. And doctors, the authors write, should ask patients with strange lesions about their hobbies.